Amy's Casablanca: Giveaway Winner and Barstool Reveal!!! Giveaway Winner and Barstool Reveal!!! which is what I wanted to give you all! 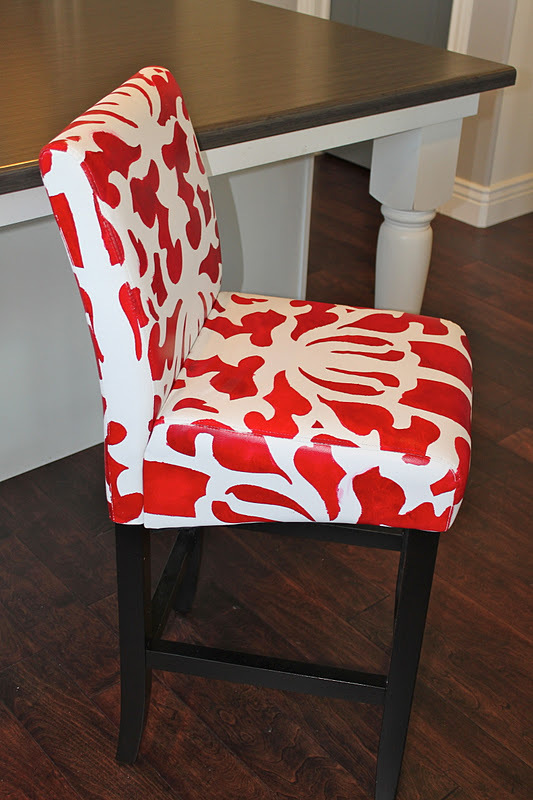 This particular stencil is from Cutting Edge Stencils "designer series" and is called Damask by Diane Papro Studio. For my original barstools (click here to see) I wanted the majority of the chair to still be white and so I chose a stencil that had small areas that would be painted. For this one I decided to try the opposite and went with a stencil that had large areas that would be painted. As a result this stencil was a little harder, used more paint, and took a little longer. The reason this stencil was a little harder was that when you bend the stencil around the curve of the top of the chair, it is hard to keep the stencil edges flat since the openings are larger on this stencil. It was a lot easier to bend the stencil on my first chairs and keep the lines clean and straight. However I really like the look of this stencil - just keep that in mind when picking a stencil if you are planning on painting a chair of your own. I decided to paint this chair red so that if I ever decide to stencil a couple more I can have a Red Christmas Set of Barstools. However after doing this chair I am having some reservations about the Red paint. 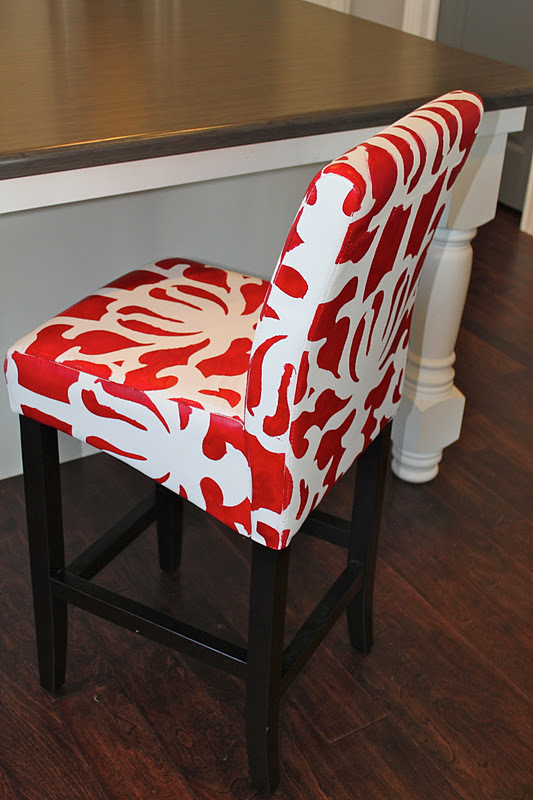 When I used the light grey paint on my first set of barstools I was able to very easily wipe up any mistakes and clean up any smudged lines so that they ended up looking very clean and exact. I was sad to discover that the red paint does not wipe up easily, once wiped it leaves a pink smudge that will NOT come off for anything! Sadly my results were far from perfect since I couldn't clean up any mistakes. I have ordered some white paint from turtle feathers which is now on its way and I am hoping that with a very small brush I will be able to clean up any smudged pink areas. This stencils pattern isn't one that requires perfection - it looks good even with little mistakes, however some of my mistakes were large, so I hope the white paint will help that. From far away it looks great but you can see in the close up pictures below what I mean. Although I ended up with a lot of smudged lines with this stencil if you were using a grey color paint you would easily be able to clean up those smudges and end up with a beautiful and crisp pattern on your chair - so don't rule out this particular stencil. 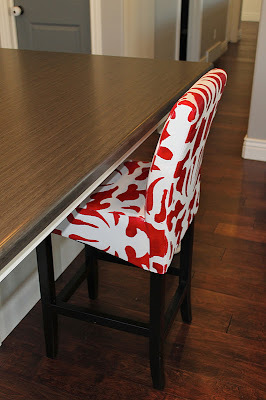 When I learned the red paint couldn't be wiped off (picture above) I decided to use tape to make sure the paint on the top of the chairs didn't accidentally carry over onto the sides. The tape worked great for that problem. When I painted my first set of chairs I didn't use tape on the sides of the chair since the grey paint wiped away easily while it was still wet. 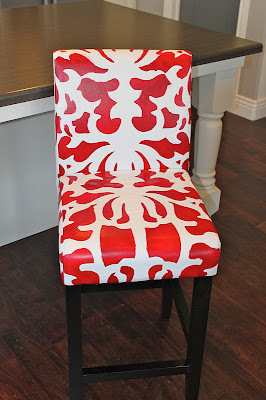 I have a couple different family members that have asked me to paint some chairs for them so I am curious to see how things turn out with the paint colors and stencils they have chosen. My guess is that Red is one of the hardest colors to wipe away cleanly - I suspect that most colors are a little more forgiving than Red. Navy blue may be a hard one as well -but I don't know that for sure. I'll definitely be posting more painted chairs so check back to see how they turn out! 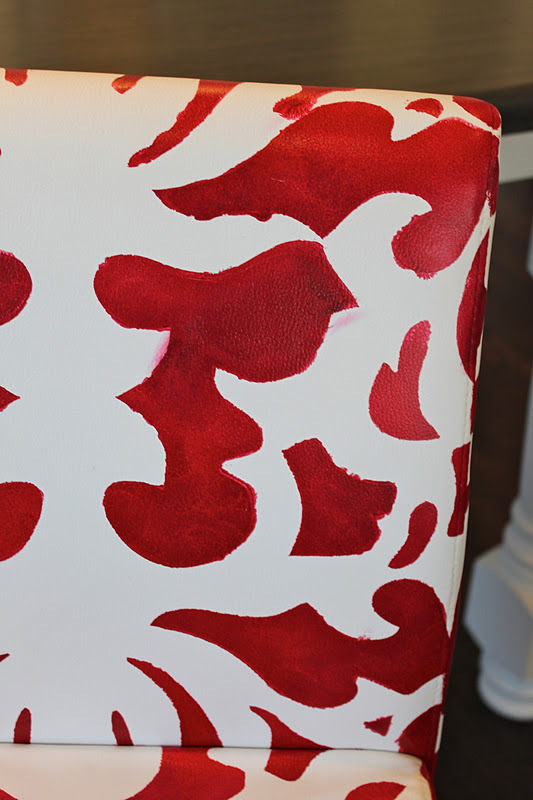 Lesson Learned: I guess I could have used the same stencil on a red leather chair with white paint and ended up with the same look and no problems! 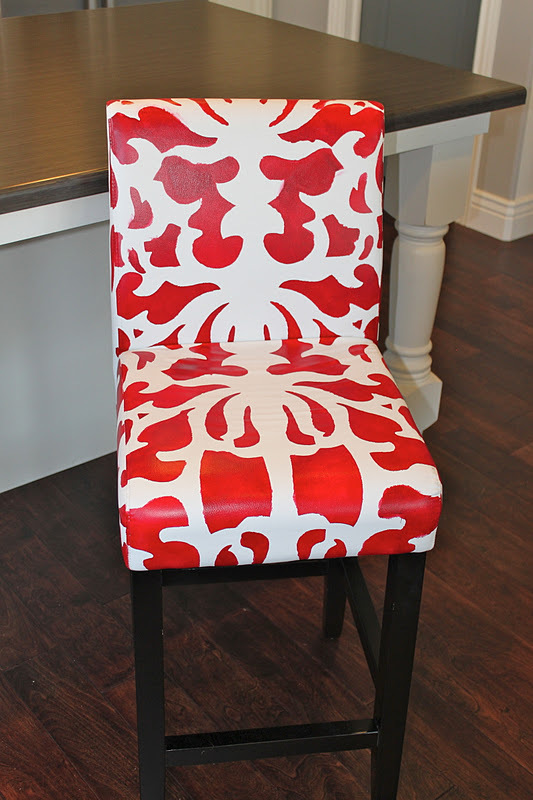 I love the chair and how it turned out but My Advice-- stay away from Red paint! The chair looks fab! I've never used stencils before, but now I'm thinking of ordering one to use in our small laundry room. Thanks for the tips! Stencil GIVEAWAY and a New Painted Barstool!! !